The first Bryant Center Hole Grinders were shipped in 1967 and offered customers an economical method of producing geometrically correct center holes – a vital requirement for precision O.D. grinding. It is also ideal for re-centering distorted centers in machine spindles, arbors, center-controlled checking devices, and other salvage work. It minimizes stock removal and greatly improves work quality and accuracy. The majority of these grinders are still in operation today, however, as with any piece of equipment, time and usage can take their toll. The remanufacturing process can breathe new life into existing Bryant Center Hole Grinders and ensures quality, accuracy, and reliability is maintained. The entire Bryant Center Hole Grinder was shipped to Fives Landis Corp. facility, based in Hagerstown, Maryland (U.S.A) where it was completely torn down and thoroughly evaluated. All required replacement parts were either manufactured in our in-house machine shop or ordered from our certified vendors. Parts in need of rework were repaired in-house by our highly trained technicians. Once all of the parts were procured, produced, and reworked, it was time to begin the reassembly process. The final assembly of the grinder was completed followed by a series of alignment checks, and an in-house “run-off”. The entire remanufacturing process of the Bryant Center Hole Grinder was overseen by a former Bryant Grinder employee, who has been working with Fives’ in-house assembly and sub-assembly technicians to train them to successfully remanufacture Bryant Center Hole Grinders. 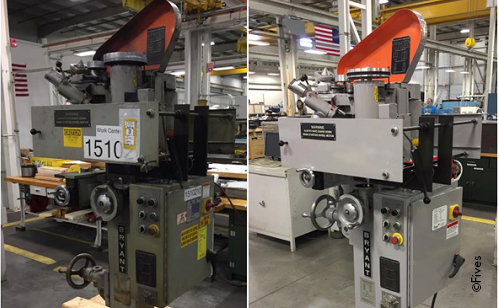 The GrinderCareSM Team is now getting ready to start remanufacturing a second Bryant Center Hole Grinder. Bryant Center Hole Grinders derive their high quality results from the combination of their 3-way grinding motion and a precision locating device. The center holes, geometrically correct, can save hours of useless grinding, speed up production, help avoid rework and insure against scrap. Ability to salvage nearly completed workparts, arbors, cutters, etc. If you have a Bryant Center Hole Grinder that needs remanufactured, please contact us!